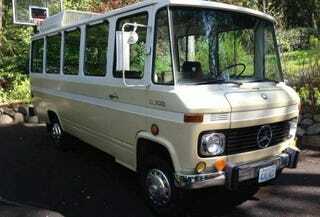 A 1972 Mercedes 309D Bus For $16,800? Oh sure, you could have a modern Sprinter, but what you really want is today's Nice Price or Crack Pipe classic MB people hauler. That being the case, hopefully its price won't mean hauling too much cash out of the bank. What do you think, when modding a car is it better two start out with a lackluster base and shock everyone by making it actually acceptable, or to start out with a great car and try to make it even better? The builder of yesterday's Honda K24-swapped 2006 Lotus Elise took the latter path, and while it's a noble effort, the consensus was that the stock car is good enough to make this one's mods seem superfluous. At nearly forty grand, its price was also viewed as excessive and it came away with a 65% Crack Pipe loss. Is This Honda-Swapped 2006 Lotus Elise A Bargain At $39,000? When was the last time you took the bus? You know what I am talking about - those moving chicanes that plague the thoroughfares at rush hour. Yeah, well just as the experience floods back into your mind, with its endless stops, bat-guano crazy other passengers, and that unmistakable smell of pee, it probably wasn't an experience that you look forward to repeating. That however, is because you don't have your own bus. Today, we're going to offer the opportunity to fix that little oversight. This 1972 Mercedes Benz O 309D gives you and 13 of your friends (or paying fares) a vastly cooler take on public transportation, than has ever been your experience. For those unfamiliar, Mercedes sold a series of big buses here in the States from the late sixties through the early seventies. Based on the Düsseldorfer Transporter, these airy busses came with a number of engine options over the years, as well as varying lengths and choices of seating capacity. This one is a 13 seater (plus driver) and is powered by Mercedes' stout 2,197-cc OM615/22 Diesel, backed up by a 4-speed stick. That's right, this bus is a manual, which is very continental. It also has one of those swing-open door controls for the driver, which is cool because you can use that to flap the door open and closed in case someone inside cuts loose with a really nasty fart. The ad claims the bus was originally purchased as a vehicle for wine tours, but has more recently done duty as a B&B shuttle and for brewery tours (winnah!). With 84,000 miles on the clock, and 42 years under its belt, it looks to be in excellent shape. The ad claims it to be all-original, right down to the seat-side ashtrays in each row. I guess people back in the day used to smoke a lot more than they do now. As you might expect of a Mercedes Diesel, the ad says this bus starts every time and that everything works as expected. The only exception to that is the huge roof-mounted A/C unit which blows, just not icy cold air - which also blows. The gearbox is said to have undergone some recent and undisclosed work, and the body is claimed to be solid but showing some minor signs of its age. What could you do with a cool bus like this? Well, you could give Kate Plus Eight a ride, with room to spare. That is, if you're a masochist. Or, you could convert it into a camper, because how cool is that? It should be noted that whatever the destiny of this intriguing MB, it's going to get there in the slow lane as it has a 55-mph top-end. It'll also take $16,800 in fares as that's the asking price. What's your take on this cool old Mercedes and its $16,800 price? Does that seem like a price that should have a new owner soon catching this bus? Or, does that much mean this bus doesn't stop for you? H/T to ilbrutto13 for the hookup!